LEARNING A SKILL, PART 1 A successful teacher can transmit his information to the student in the most effective manner possible. To help achieve this goal, it is important to understand how the student receives the information the teachers is sending him. Rather than delve into theories of learning a skill, use simple techniques to reach a student without the scientific clutter, although the goals are the same. Sports performance is basically how one’s psychomotor skills react to achieve a goal. The term “muscle memory” is misleading. Information is stored in the body’s computer – the brain. The brain is what stores memories. Many sports have similar actions and movements. All sports that require body rotation rely on the same core muscles as the source of stability and power. Therefore, when a student has already performed other sports, often it is easy to transmit the same images to the golf swing. Too often a teacher pushes a student with excessive images and thoughts that lead to “overload.” Try this experiment. Hand a beginning golfer a golf club and tell him to hit the ball. That’s all. Most of the time, they will make contact. LEARNING A SKILL, PART 2 The golf swing is basically a natural movement. When a child picks up a stick and swings at a pine cone, nobody explains the techniques of “hitting a pine cone.” Therefore, in your teaching, try to start as basic as possible. Let the movement begin naturally and let it ingrain with repetition. In many cases, less is more. The same can be said with advanced golfers. Often, good golfer feels as if a swing change is a huge undertaking, when in reality, it might be as simple as a few centimeters. Even advanced golfers should work on simple drills and exercises to “age” a swing change. For example, I have a client who is a scratch golfer. Since he was a child, he had a huge loop in his swing. He came to me one day and said, “The loop in my swing is gone! I have worked it out! Watch me hit some balls, Pro.” As I watched a few shots, every ball was straight down the middle, but the loop was still there. In his mind it was gone and his performance was elevated. For the next year, we didn’t let him see his video and I gradually worked the loop out little by little. He was hardly aware of it because I kept the drills simple, never more than one exercise at a time. Important points to remember when teaching a skill: •	Let natural ability guide your students. 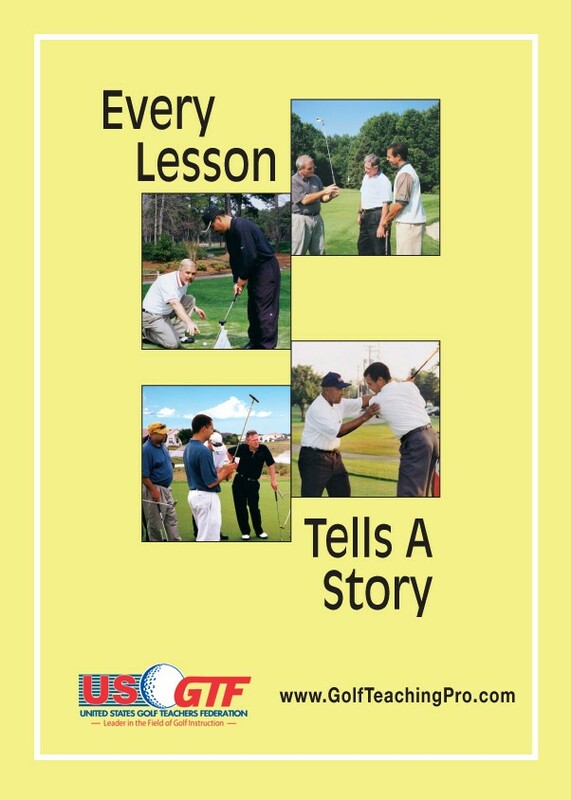 •	Limit the amount of information, especially with beginner golfers. Old ingrained habits can be changed. It is simply a matter of: •	Understanding the fault. •	Finding a simple, effective exercise or thought to correct the fault. •	Repeating and aging the correct movement. The brain is a powerful instrument. If we can find a simple way to correct a fault, we can have immediate results. But, often when a golfer finds a way to correct a fault, he thinks that after a few shots that all is cured. In reality, to produce a correct repeating motion one has to: • Age the correct motion until it is ingrained, and / or • Have a clear mental focus with a simple thought to produce the correct movement.